Find out how you can get involved and support Mayhew. There are plenty of ways that you can fundraise for Mayhew from bake sales to skydiving. We always need a helping hand at our events throughout the year. If you think you could help run a stall or lend a hand then please get in touch with our events team. You can support Mayhew and our work by giving a donation or a gift in your will, in celebration or in memory. 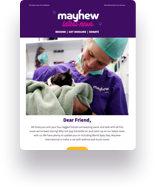 You can make a one-off donation to Mayhew's animals with the touch of a button.